CANTON, Mich. -- Recently, Local 4 aired the heart-breaking story of a family forced to part with their two dogs because of illness. Dozens of Local 4 viewers offered to take the dogs. And many people have e-mailed or called wanting to know how the dogs are doing. John Bergmann and his family had to give up Harley and Baron because John's wife is very sick with Crohn's disease and other illnesses. Ironically, Harley has a similar condition called Addison's disease. Moments after the Ruth To The Rescue story aired, Local 4 received an e-mail and phone call from Samara Burgos in Canton. "I thought, 'Oh my gosh, I've been looking for these dogs -- how ironic. We've been searching the Internet and here's someone who's giving away a weimaraner and a vizsla,"' Burgos said. 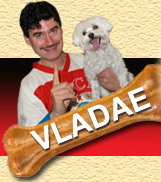 Dog trainer Vladislav Roytapel donated his services to make the transition easier. Now Harley and Baron have a big back yard and three children with whom to play. The Bergmanns said they're thrilled that the dogs have been able to stay together and have such a great new home. And because this is an open adoption, the Bergmanns will visit the dogs in the next few weeks.